The first Africa Forum on Business and Security, organised by the New Security Foundation, included a session entitled “Education, Training, and Skills: How to Develop the Skills Necessary to Stimulate Africa’s Economies”. Speakers emphasised that securing education is a vital component in creating environments that foster sustainable development and encourage successful businesses. New technology has an important role to play by allowing modern education infrastructures to adapt to difficult environments and increase accessibility. The session, chaired by Lt Gen (Rtd) Andrew Graham, featured presentations from Sautii Kuu Foundation chair Dr Auma Obama – half-sister of U.S. President Barack Obama; Brig Gen Marcel R.D. Chirwa (Rtd), Executive Secretary, Africa Peace Support Trainers Association; Dr Bakary Diallo, Rector, African Virtual University; and Dr Simon Mamosi Lelo, Director General, CAFRAD. To view key moments of the Session please click HERE. Future conflicts will be less violent but more intense. A central feature will be the struggle for control of information systems and the achievement of ‘perception dominance’. 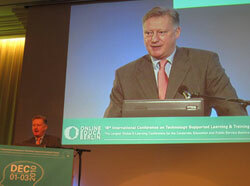 A radical rethink of the nature of security-related education and training will be essential to meet the challenge. This was the verdict of three leading experts from the United States, India and Great Britain, when we asked them at Security & Defence Learning 2010 for their views on how conflict will develop and what the implications will be for training. Click here to watch our film on ‘Future Conflict and Learning’ with Col. Dr. Jeffrey McCausland, Col. Amardeep Bhardwaj and Chris Donnelly, CMG. Have you read New Security Learning? We are delighted to introduce you to New Security Learning, a monthly e-magazine for training directors, managers, planners, academics and other professionals involved in training and development decisions in the security, defence and emergency services sector. New Security Learning contains news, features, interviews and comment columns, highlighting recent developments in ICT-enhanced learning and training for the security and defence sector. It provides a platform for discussion of key issues and a basis for cooperation, networking and the sharing of best practice. The highlights of each upcoming edition are distributed in the form of a newsletter to over 10,000 of our key contacts holding leading positions in Ministries of Defence, Ministries of Interior and Education, Police Forces, Fire Services, Armed Forces, Emergency Planning, Resilience Authorities, EC (European Commission), NATO, ASEAN, UN, INTERPOL, OSCE, IMO (International Maritime Organisation), and many other international institutions and organisations. 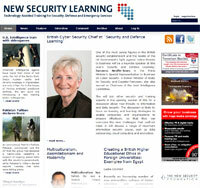 The complete content of the online magazine is now available free of charge on the New Security Learning website. Participants in ‘Security and Defence Learning 2012’ and SDL Educa are also invited to join leading experts at a special discussion luncheon on the Euro crisis and its possible security consequences. The lunch will be hosted by the New Security Foundation, organisers of SDL, and it provides an opportunity to discuss not only the possible implications of the crisis for European security but also how to prepare for them. At the luncheon, economic analysts will join security experts for a debate about the implications for Europe of a failure to solve the currency crisis. Speakers at the meeting, which is the first in The New Security Foundation’s series of ‘Politeia Circle’ luncheons, will include Wolf-Rüdiger Bengs, former spokesman of the Bundesbank, Klaus-Peter Willsch, Member of the Bundestag and co-founder of the ‘Alliance Against the European Stability Mechanism’ and Baroness Neville-Jones, former UK Minister for Security and Counter-Terrorism and Chairman of the Joint Intelligence Committee. Please click HERE to reserve your place at the luncheon, which will take place from 12.30 – 14.30 at Hugo's Restaurant in the Intercontinental Hotel, Berlin on 28 November 2012. Innovation and learning in rapidly changing security environments will be two of the most significant, underlying themes in discussions at this year's Security and Defence Learning, according to conference hosts, the New Security Foundation. Dr Yan St-Pierre, Director of Programmes at the New Security Foundation says that the agenda for the Forum, which is available HERE, has “a heavy emphasis on innovation and learning for change.” SDL 2012 will focus on new developments in the use of mobile technology, encryption, information security, innovation, implementation and the impact of gaming. This year, with the focus on innovation, there will be an even closer connection between SDL and the rest of Online Educa too. Security and Defence Learning 2012 will see the regular pre-conference forum expand into the main conference programme with the creation of SDL EDUCA, a new “security track” at OEB, which will address some of the specific security-related issues educators and e-learning specialists face every day, highlighting new opportunities for technology-assisted learning providers. SDL EDUCA will focus on the Internet's hidden dangers and how to deal with them (Nightmare on Web Street); the SDL Lab How to Improve Your Online Security will teach participants the basics about improving their online security; and a session on Piracy, Privacy, Personal Identity and Security will consider how to prevent manipulation, fraud, plagiarism and the unauthorised obtaining of information from the Internet; Finally, the Breakfast Session (November 29th) What education professionals can learn from the security and defence industry, will bring together experts from the defence and education sectors to discuss what education professionals and providers can learn from the security industry. The Security and Defence Learning Forum and SDL EDUCA events, which include an After-Forum Lounge, as well as the New Security Foundation Luncheon, begin on November 28th at the InterContinental Hotel in Berlin. Full details are available HERE. Registration for Security and Defence Learning 2012 and for SDL Educa HERE.